The film begins with a brief introduction telling the tale of a fantastical land of animals, whose great warriors fight for the prize of becoming the new lord. When these animal lords pass away they become new gods. We are then introduced to a young human boy Ren, whose parents are recently divorced. Feeling frustrated he runs away and ends up living on the streets of Shibuya. Ren is discovered by an anthropomorphic bear and monkey. Following them he finds his way into the animal world. The bear turns out to be the legendary fighter Kumatetsu who must do battle with the boar Iozen. Kumatetsu decides to take Ren in as his disciple, renaming him Kyuta (a play on him being 9 years old). Kumatetsu is slovenly, arrogant and a terrible teacher, being self-centred and stubborn. However, Kyuta soon begins to learn from him, and he from Kyuta. When Kyuta returns to the world of humans he must make a difficult choice to leave Kumatetsu, his surrogate father, behind and return to his real father and his real life, or to support him in his most difficult hour. 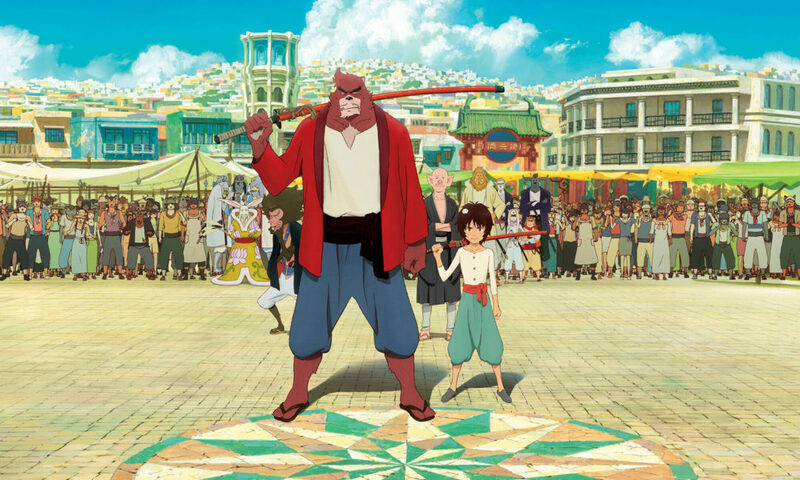 Written and directed by Mamoru Hosoda (Wolf Children) the film is a poignant exploration of masculinity and fatherhood. Though their relationship is dysfunctional there is affection between Kyuta and Kumatetsu. Each lacks the emotional intelligence to express themselves verbally, but nevertheless they provide support for each other, complimenting the others’ weaknesses. In the case of Kumatetsu it is his inability to listen or learn from others, in Kyuta’s case it is his lack of strength or self belief. The animation in the early portions of the film takes us on a journey through the dark back alleys of Tokyo, with abandoned bikes, the eerie glow of vending machines, as well as the bright lights of Shibuya’s famous crossing. When it moves to the world of animals there is a definite shift in tone to a more lighthearted art and animation style. This works fantastically well in creating a definite intersection between reality and fable. What Ren learns in the fantastical world of Kumatetsu is a good way to explore what might be difficult themes in a human drama. There is plenty of humour and clowning here that captures a childlike sense of joy and wonder while at the same time not shying away from the seriousness of what Ren is experiencing. The central theme of the film is that of a father son relationship. Through Kumatetsu and Ren’s fraught experiences with one another they both grow to appreciate having a surrogate parent or child. Kumatetsu’s violent outbursts are softened by his characterisation as a bear creating a safe way to explore themes of parental aggression. We learn to sympathise with both Ren and Kumatetsu and understand why both act the way they do, while also willing them to resolve their differences. At the end there are touching moments later in the film when you realise that their anger is a sign of affection. The film also deals with themes of strength and masculinity, particularly in relation to Ren’s journey to becoming a man. It asks the question of what true strength is, whether physical or emotional, and how important that is for surviving life’s hardships. This is an important film for understanding not only the stresses that divorce and separation from a parent can have on a child, but also offers a male perspective on how to deal with these issues.